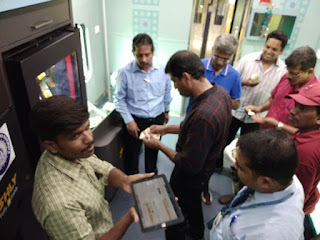 In its first, a tab-operated automatic vending machines have been installed in Coimbatore - Bengaluru Uday Express which was flagged off on Friday. The train was flagged off from Coimbatore Junction by Minister of State for Railways Rajen Gohain. The salient feature of this machines is that is can be operated using a tab and the current inventory includes tea, coffee, aerated drinks, canned juices and packets of some snacks. Passengers can choose the items from the list and add it to their cart, once the payment is done, the machines automatically dispense the items. The double-decker Uday Express will run between Coimbatore and Bengaluru.